Hello, everyone! Welcome to day 1 of our May Gina K. Designs blog hop! 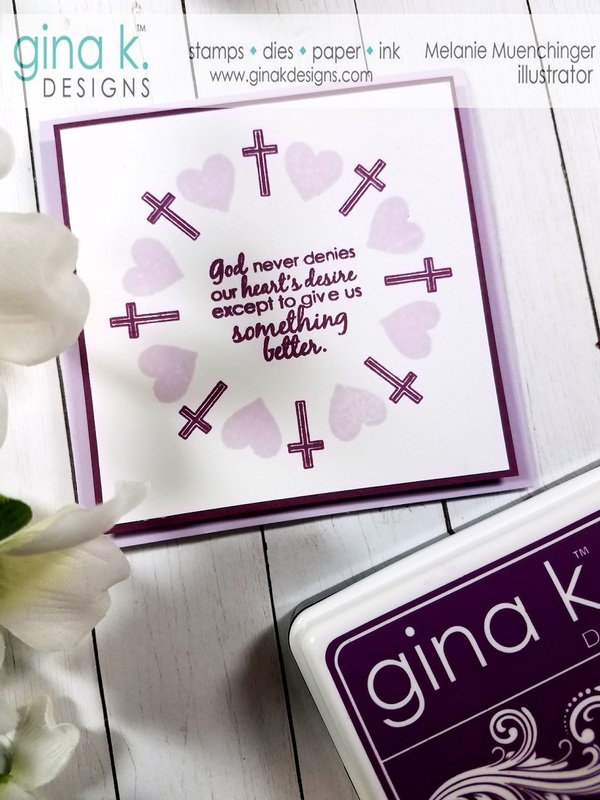 Today we are showcasing two sets: Women of Faith by me and Anemone Wishes by Emily Schroepfer. 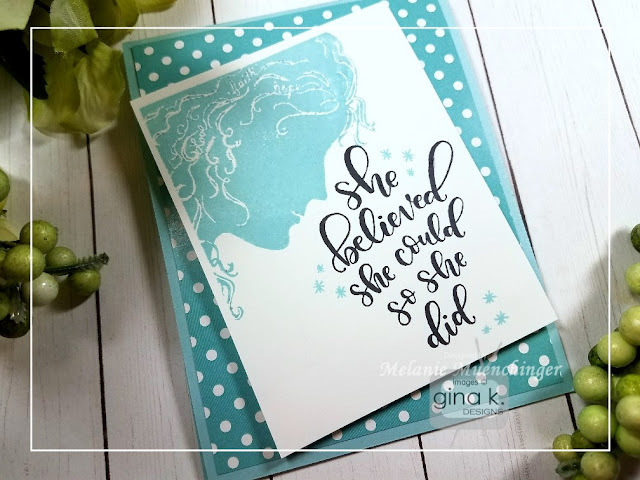 After enjoying each visit on our design team hop, be sure to comment on each blog because we are giving away a $25 gift certificate to the Gina K. Designs store! Each comment you leave is a chance to earn the gift certificate! We will announce the winner on StampTV a few days after the hops conclude. I had to share a sample with my Hands, Head and Heart quote! 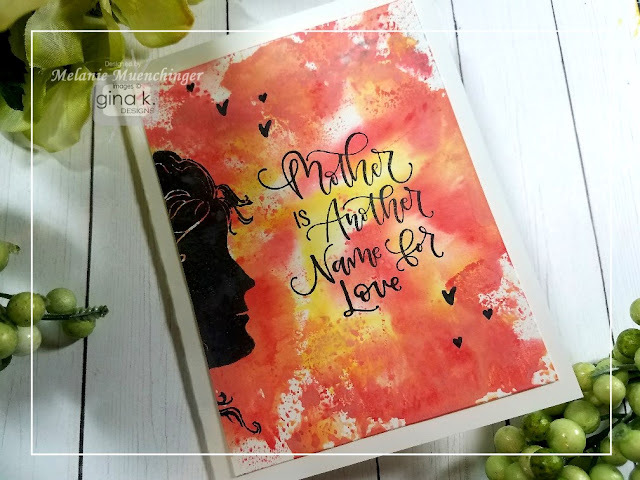 I love all these ideas I've been hearing from you since Thursday for this sentiment in your cardmaking and crafting! Here I did some no line coloring and colored with alcohol markers. I gave one marker a couple hard taps to create the little peach spatter on the mat and LOVE how it looks like pollen coming off! Cardstock is White, Black Onyx and Peach Bellini. I also enjoy "dressing up" this silhouette with other stamped images! 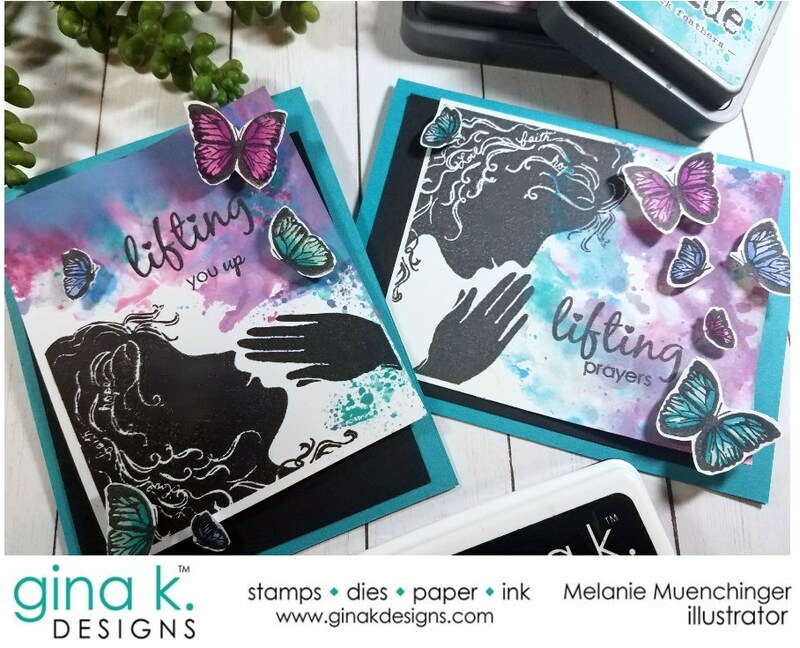 Here I stamped my girl in GKD Kraft and used the branch and bold flower in Lisa Hetrick's Hello Beautiful set, in GKD Jet Black and Lipstick. 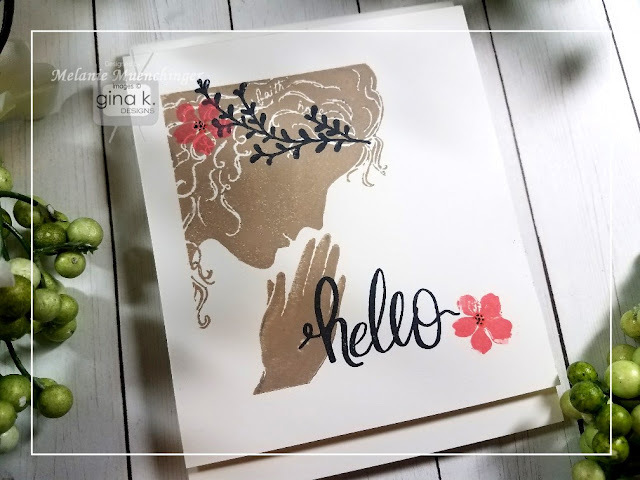 I added her gorgeous hello greeting and a few dots with a pen to the flower centers to pick up the black. Cardstock is GKD Pure Luxury White. Finally, I love this dahlia image in the set, for when you really just want flowers and not a lady! Coincidentally, these little pom pom blossoms are so fluffy and *just* about the exact size and shape of a jumbo sponge dauber! Oh yeah, just ink it up and smoosh it down once, done and done! I used the new Plum Punch, Sea Glass and Tangerine Twist. Greeting is from the new Incentive set Wealth of Wishes, free with any purchase of $75 or more before shipping! These long greetings and fonts go great with all these images! And flowers always need butterflies, don't forget that! Another with a sentiment from Emily Schropefer's Lettered and Lovely. Ink and cardstock is GKD Ocean Mist. 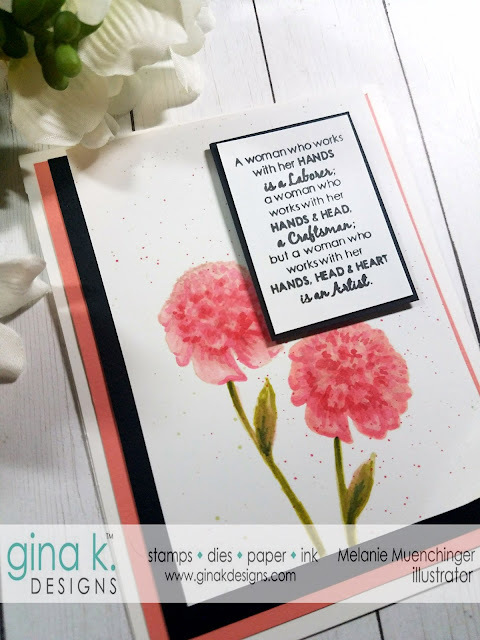 Patterned paper is from the GKD Bold and Blooming pack. 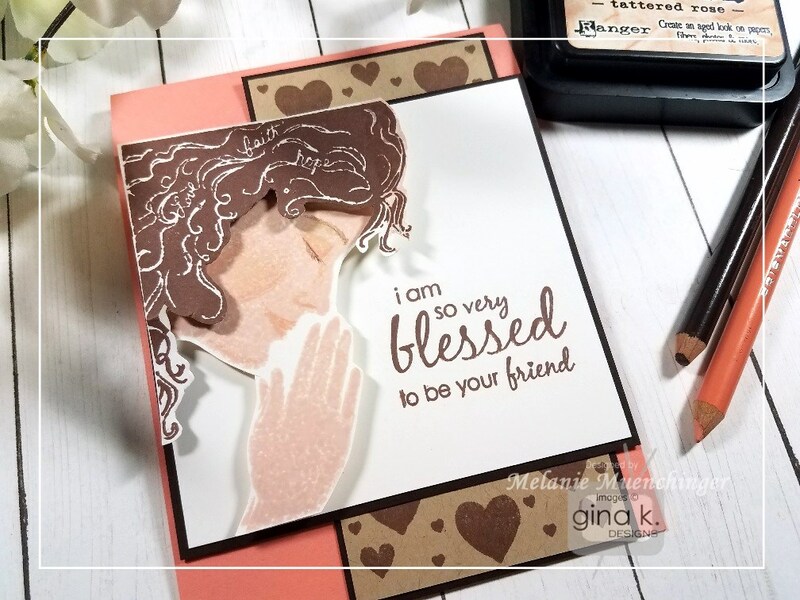 Today I am sharing a peek and card with my newest stamp set, “Women of Faith”, coming out tonight at 7 PM Central! 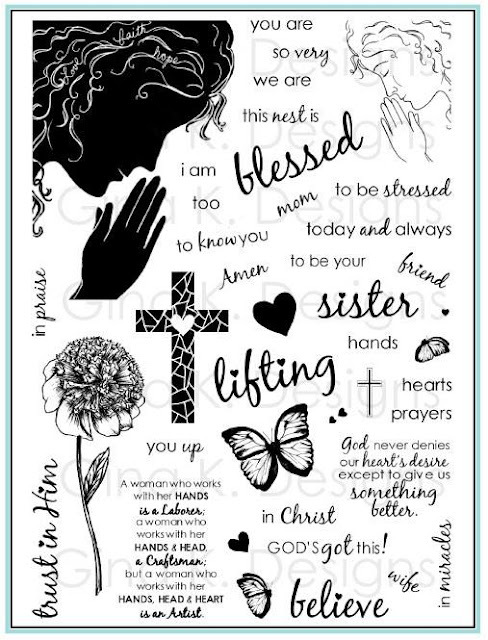 This set was designed to honor so many special people and life events, and you will love this large silhouette profile that works for so many inky techniques, along with the other faith based greetings and images included. 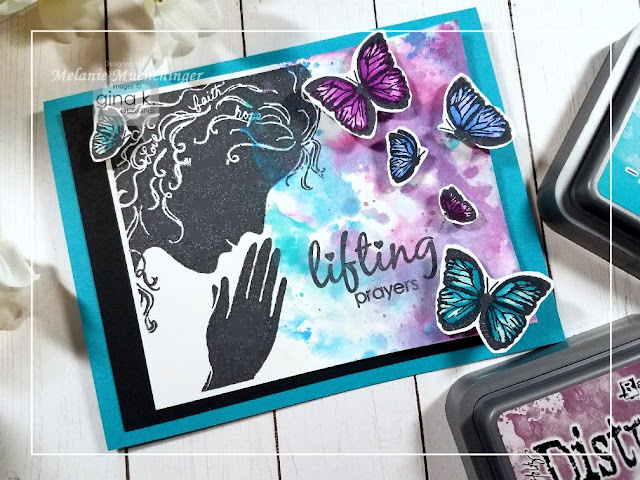 The ethereal background for this beautiful card is created with Distress Oxide inks, Distress Sprayer, and new butterflies! Be sure to watch to the end to see a special quote that inspired my blog title and is perfect for stamping on the back of your cards! Please enjoy! 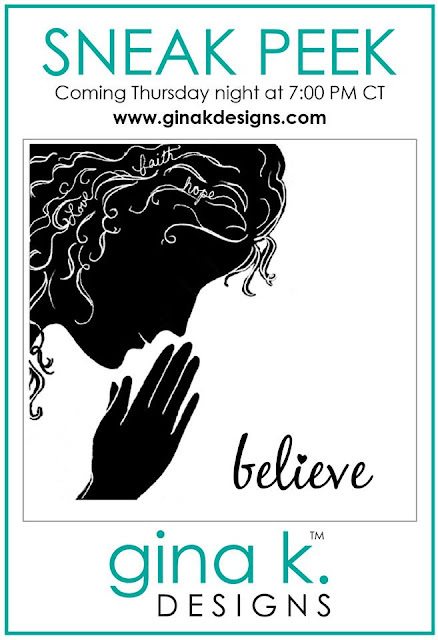 Women of Faith stamp set will be available for purchase Thursday night, May 10th, 2018 at 7PM Central at ginakedesigns.com ! 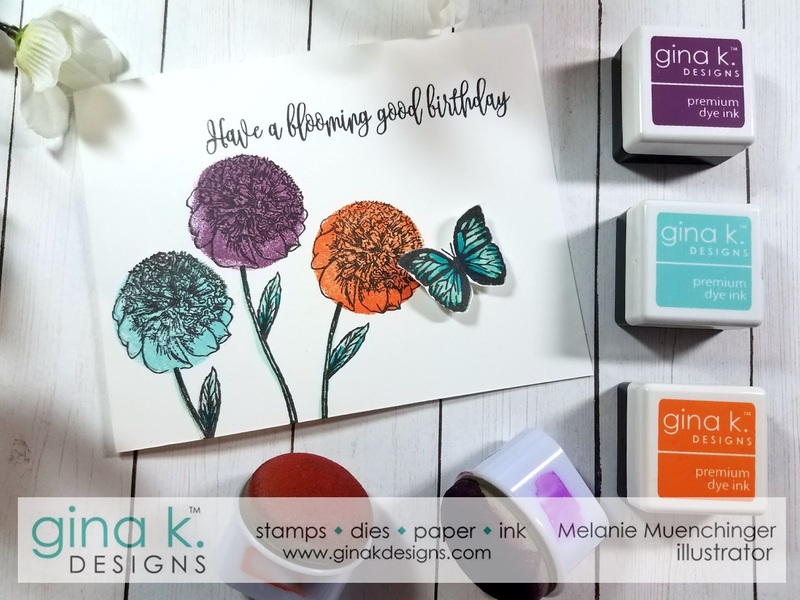 Would love to see you at the party at StampTV, okay?! Join us! It's almost here! Oh, how I've waited and waited to release this set! So many ladies, life events and answered prayers that inspired me to create it, and so much to share with the many images and greetings included! You are going to love this one!